Dear Mr. Ferguson, I’ve not previously heard of you before. You aren’t really in my genre. So, maybe my opinion doesn’t matter. In my defense, I consider myself a very well rounded reader who enjoys the odd thriller, particularly ones about international issues. Something about your book made me put it down, unable to finish it. 419 is about global consequences and the thin way in which survival loops together exploitation. A retired school teacher in Calgary commits suicide. His family soon learns that he was suffering financial ruin at the hands of a Nigerian 419 internet scam. His daughter, Laura, wants retribution for his death. The Canadian police have no ability to enact justice in Nigeria. Laura travels to Nigeria herself, putting herself in great danger because the 419 scammers are linked to crime lords who are accountable to no one. One narrative follows Laura, the teacher’s daughter. Another narrative follows Winston, the man in Nigeria who makes a living frauding people of money. There is also a narrative about a pregnant African woman that I don’t know much about, but she is starving and traveling through Africa and looking for someone. That’s as far as I got. 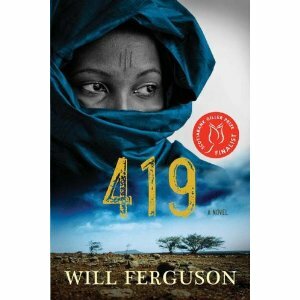 The premise of 419 was interesting and the characters were decent. Dialogue was on par with any decent author. But the 340 pages of 419 were not compelling enough to keep reading. There was this lengthy diatribe about the “Shell Man” and the oil exploitation that “white man” has imposed on the Nigerians in recent history. As legitimate as the story of the death of a culture, and the exploitation of a vulnerable people, these chapters did not seem credible. Or perhaps they seemed to simple. But I found it bulky and boring. Not every book is for me, and someone else might like this. It may make an interesting gift idea for a person who reads lots of National Geographic (ie my Dad). It almost reads like investigative journalism, or maybe like a Robert Ludlum novel, but with less suspense. The long and short of this is, it’s been an interesting Giller shortlist. This one was surprising for me.